This article submitted by Michael Jacobson on 2/23/00. Over 50 years ago, Clarence Bertram started with a single ewe on his dairy farm near Spring Hill. "She had two lambs. Then the next year she had three more, and I've had sheep ever since," he explained. Now he can keep his 50 ewes and one ram in the dairy barn, since he quit milking ten years ago. Bertram's ewes have had four sets of triplets this year and he had 11 sets last year. Recently, the ewes have been lambing, delivering mostly twins but also some singles and some triplets. Last year, he had 11 sets of triplets, and with the lambing half done his ewes have had four sets so far this year. "I'd sooner have two good ones than three," he said. "Sometimes three can be a problem." They are normally smaller and may need to be given milk by hand if the mother can't support three. While he had dairy cows, the sheep had to stay outside year-round. Then the lambing needed to be done in the spring, when it was warm. Since they can use the dairy barn now, he has changed the schedule. He has the ram start breeding in August, as it takes five months for the ewes to gestate. Lambing begins in January and should finish by the end of February. Last year, he had 90 lambs, which is close to his goal of two lambs per ewe. 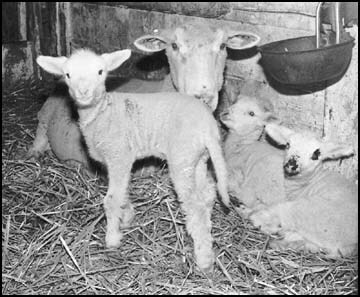 Most of the lambs will be fed out to 130 pounds, at which time he will sell them for slaughter. The current price is 72 cents per pound for lambs. He also sells older ewes and replaces them with a lamb. It takes four to five months to get the lambs ready for market. The remaining sheep spend the summer in the pasture. In the summer, he still does some crop farming, with the help of his sons. His sheep eat hay and oats grown on the farm. The lambs, while being fattened for slaughter, also eat a concentrate from soybean meal. "It's a good hobby for the wintertime," said Clarence of raising sheep. "It gives me something to do." He laughs when he thinks about how much it costs him to sell their wool. He always has the shearing done just before lambing, so the newborn lambs have easy access to their mother's milk. This January, he got 20 cents per pound for his Columbian wool. His ewes averaged 13 pounds of wool apiece, yielding him $2.60 per sheep. But it cost him $2.75 apiece for the shearing, plus he hired his grandsons to help gather the sheep. "It costs me more (for the) shearing than the wool is worth," he exclaimed. At least he didn't have black face sheep, for whom the wool price was only 10 cents per pound. Back in the 1950s, Clarence remembers wool being worth $1.08 per pound. "It's the worst this year that I think it ever was," he said. Most people don't want to keep sheep because they can be a nuisance, Clarence says. For instance, they like to run from dogs, they like to be where they shouldn't, and they like to bellow. Normally, they're pretty content, but if you move them around, they can make a racket. Clarence can hear their bellowing from the house. "The neighbor can hear it, too," he added. He likes to tell a story about a boy in a schoolroom to demonstrate another behavior of sheep: how they like to follow. "Eight sheep are in a pasture and two leave. How many are left?" asks the teacher. "You must not know your arithmetic," says the teacher, citing a correct answer of six. "Well, you don't know your sheep," responds the boy. "If one sheep gets out, they all do."